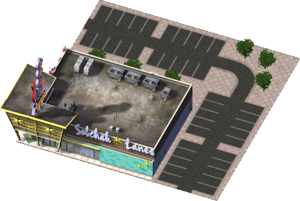 The Sobchak Lanes is a downloadable Landmark Building for SimCity 4 Rush Hour/Deluxe, released as the Plugin Pack 034 free Downloadable Content. The building's signage is largely based on that of Los Angeles' Hollywood Star Lanes, used as a Filming location in the 1998 film The Big Lebowski. The game references one of the film's characters, Walter Sobchak, in its name. It was closed and demolished in 2002 to allow construction of the Kingsley Elementary School. Sobchak Lanes shares almost all of its building properties with Lucky's Hang Ten and the Rockefeller Center, the latter of which was probably a mistake. It's also one of only a few DLC buildings that have no files for a language other than US English, a trait it shares with Lucky's Hang Ten. This page was last modified on 9 May 2015, at 10:34.